Blending -- SE (Student Edition) provides students with an engaging iPad application to practice and master letter blending skills on their own after receiving instruction from their teacher. 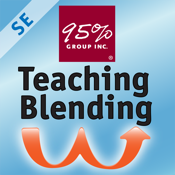 The app is used to reinforce the concepts taught by the classroom teacher using the 95 Percent Group Teacher’s Guidebook, "Teaching Blending: from /k/ /ă/ /t/ to cat in 8 Stages," and the companion teacher's app, Teaching Blending - TE (Teacher Edition). Please see App Store and the 95 Percent Group website for additional product information. The Student Edition app includes the animation, sound and manipulative exercises so important for young learners. The student's voice is recorded pronouncing words and played back to compare with the recorded teacher pronunciation. The student self-corrects and repeats as needed. Each stage within the app provides students with ample opportunity to practice skills using a number of different letter/word combinations. The stages progress from one word to 3 words and from sounding out each letter before pronunciation of the word to pronunciation without sounding out each letter. At any point in the app, students may get assistance from the help icon which gives verbal instructions in both English and Spanish. After the introductory stages, each stage within the app provides the student with an opportunity for skill mastery by enabling recording of his or her voice and comparing it to a teacher’s pronunciation of the letter combinations. This app has proven highly effective with students, leading to mastery at significantly earlier times in the school year. Students are commonly taught how to do continuous blending (sound by sound and then blending to read the word) and then left primarily on their own to learn how to read whole words blended without sub-vocalizing. Many students struggle with this approach. The Teaching Blending Teacher Guide and the related mobile apps provide opportunity for practice in the stages needed to transition a student from reading words sound by sound to reading whole words blended. Teaching Blending Student app is a fun and appealing way to transition students in Grades K and 1 to reading whole words blended. Students using it have shown outstanding progress toward mastery of these skills. Please note that this app is intended for Kindergarten age and above. Apple's rating system (4+, etc.) indicates maturity level, not educational level, and the 4+ rating indicates the absence of inappropriate graphics, language, violence, etc.